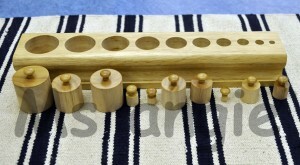 The 4 wooden blocks of cylinders, each containing 10 cylinders with knobs, fitting into its respective holes (sockets) in a given block. Block 1: The cylinders vary in both diameter and height. 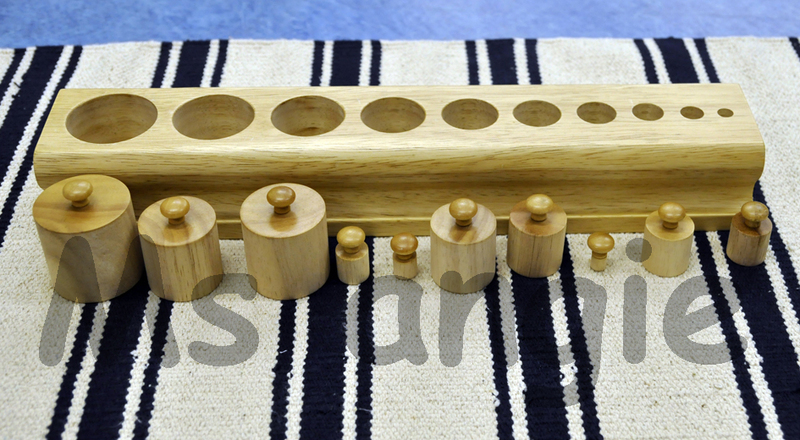 Each cylinder increases or decreases by 0.5cm on each dimension from the preceding one. The tallest cylinder has the biggest diameter. Block 2: The cylinders vary in both diameter and height as in Block 1, but the tallest cylinder has the smallest diameter and the shortest has the largest diameter. Block 3: The cylinders vary only in diameter. They are of the same height. 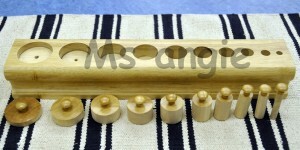 Each cylinder increases or decreases by 0.5cm in diameter. Block 4: The cylinders vary only in height. They are of the same diameter. Introduce the exercise to the child and show the child how to carry the cylinder block. 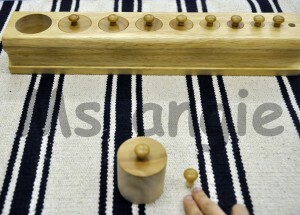 Slowly remove the extreme left and right cylinders by holding the knob with the thumb, index and middle fingers. 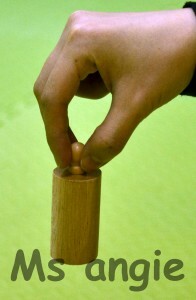 Place it on the table use the right index finger to point at the bottom of the cylinders. Put back the cylinders into their respective sockets. 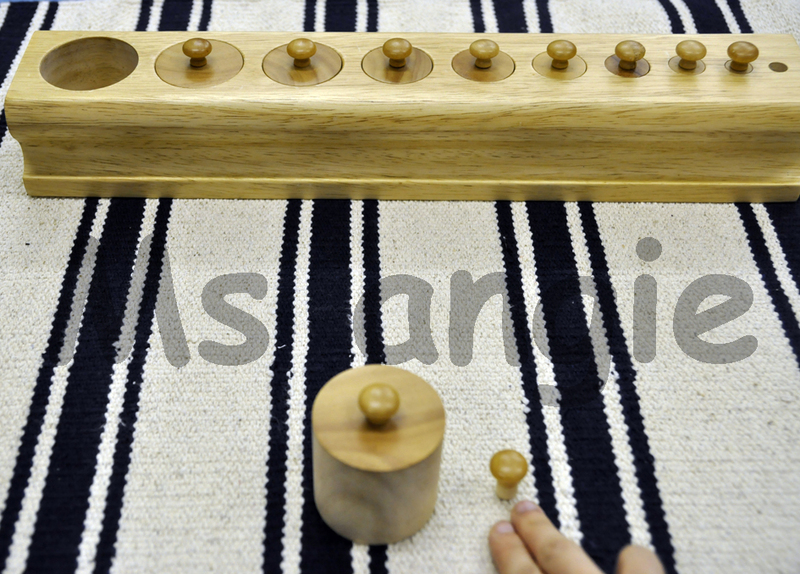 Remove each cylinder from left to right placing them in a mixed fashion in front of you. 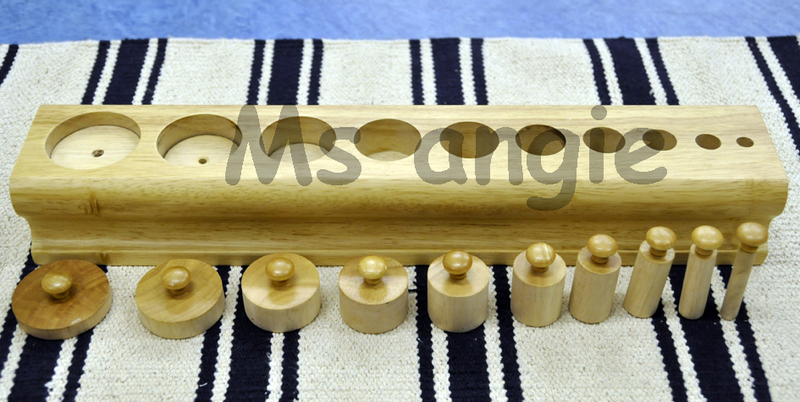 Lean forward to look into the empty sockets of the cylinder block.Carefully place each knobbed cylinders back to its sockets, starting from left to right.Place the cylinder block back to the shelf and invite the child to carry out the exercise.